In the last post you saw all the lovely outcomes, all the pretty pictures, all the wonderful things about the bag I made for my New Zealand trip. (If you want to see lots and lots of pictures, just scroll back through the last two month’s worth of posts, or search “Travel” on my blog.) Now you get the REAL story. Maybe some people are able to do things wonderfully well the first time they try something, but I really think those people are rare. They certainly are NOT me. I went all-out being leather and all the other bits and after months of thinking about the design I made a pattern and started out gung-ho sewing. What I didn’t know, is what I didn’t know. I’ve never really sewn with leather. 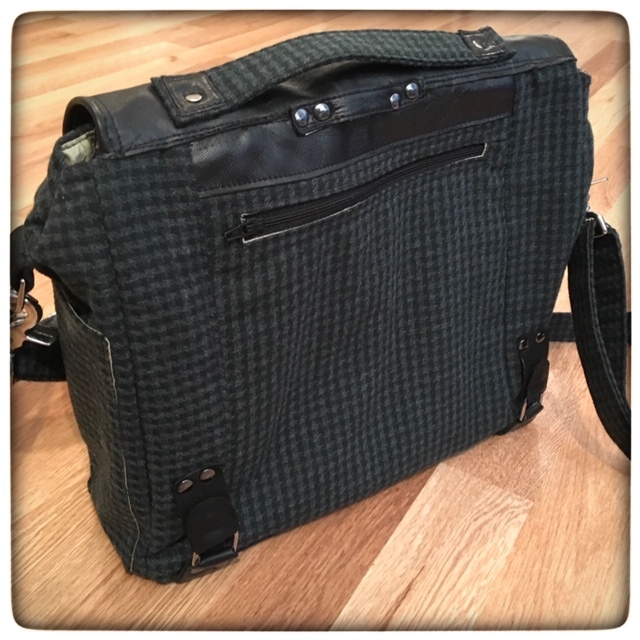 I loved the look of the bag but a few days of carrying the thing around and I realized it would be unworkable. Sigh. Leather isn’t cheap. It Looks pretty GREAT! I absolutely love the super soft leather. The pockets are a perfect size to fit my iPad and a couple of hand-sewing kit bags. But…. Problem #1: When the bag is full, the swing clasp won’t shut. 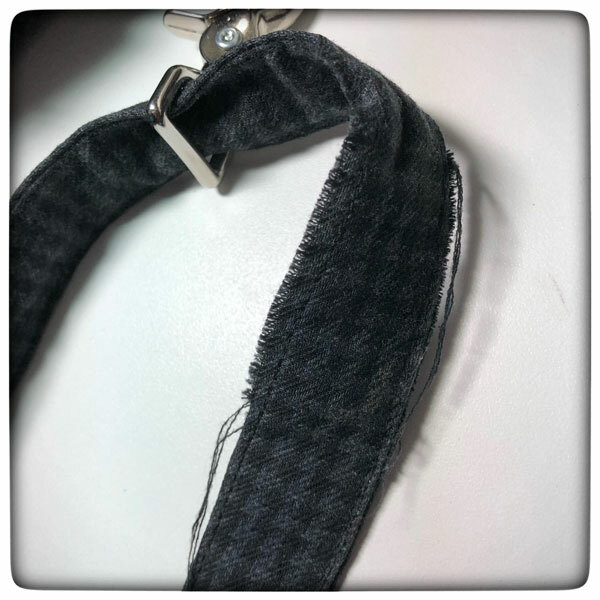 Problem #2: When the bag is not full the swing clasp comes undone. Problem #3: The clever little side clasps that keep the sketchbook flap shut are difficult to manage. 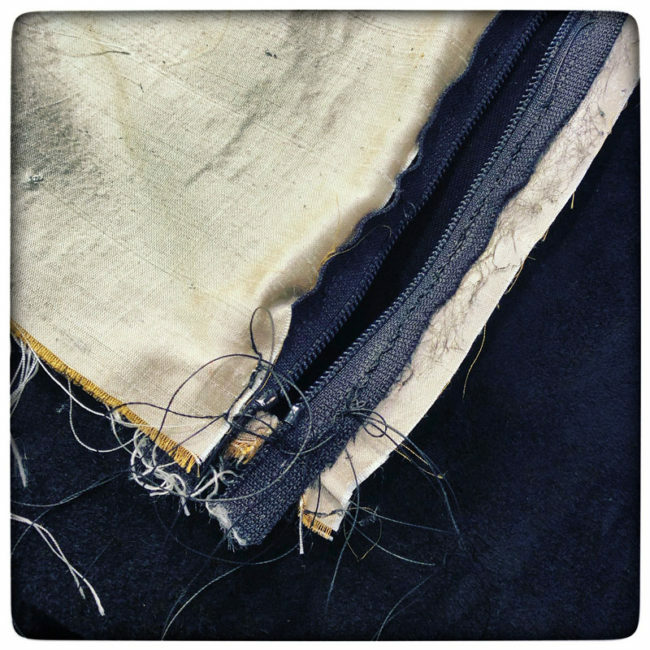 Problem #4: There is NO WAY my machine could sew through all those layers of leather on the side so the edges are raw. I’m thinking of just painting those edges. 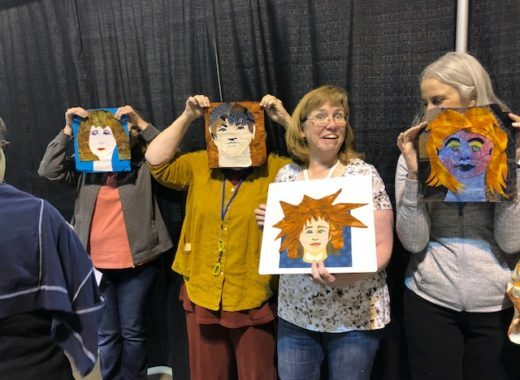 The Perfect Travel Bag for Artists Take 2 was much more successful, but not without many mishaps and trials. For the sake of reality – here is a rundown of all the stupid things I did and what I learned in the process. Mishap #1: I sewed an interior pocket wrong side out. Fusible web was supposed to adhere pocket to the outside and lining of the bag so it wouldn’t droop. Instead I had the fusible web on the inside of the pocket so it would fuse shut if I ironed it. I don’t remember how I fixed it. Hmm. I think I fused another piece of silk to that part of the pocket so now it is double layered but not fused shut. Mishap #2: Lesson learned – that I already know but apparently needed to learn again! 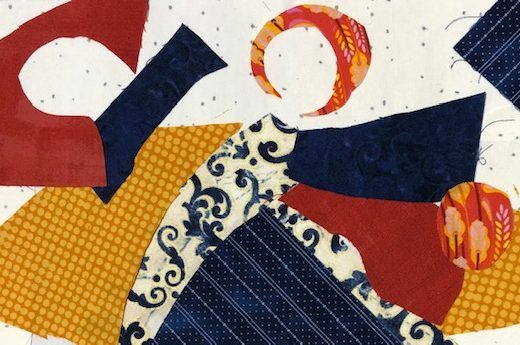 Test your cloth content. I thought this was a lovely light weight wool. It is not. Wool does not melt the minute an iron touches it. 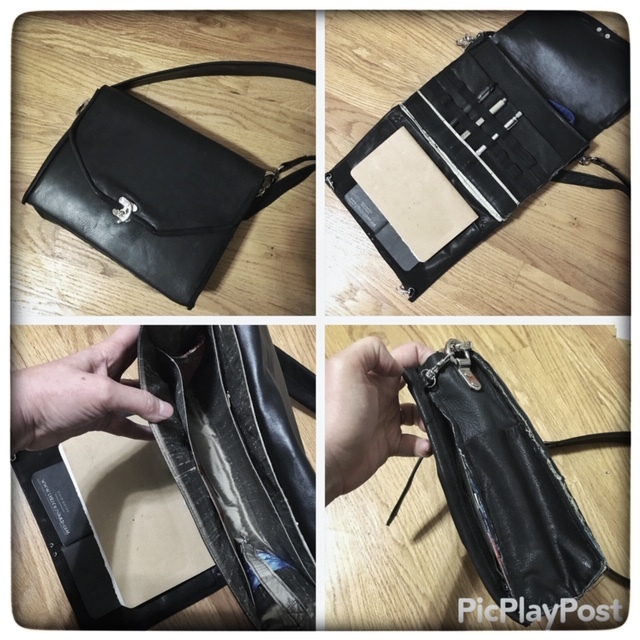 Fix: The back of the purse is now priced. 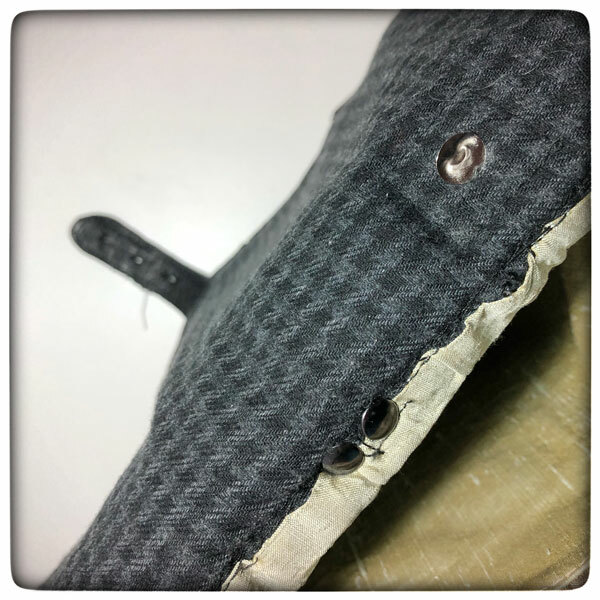 The leather strip at the top covers the damaged fabric and strips along the side replace the hole. 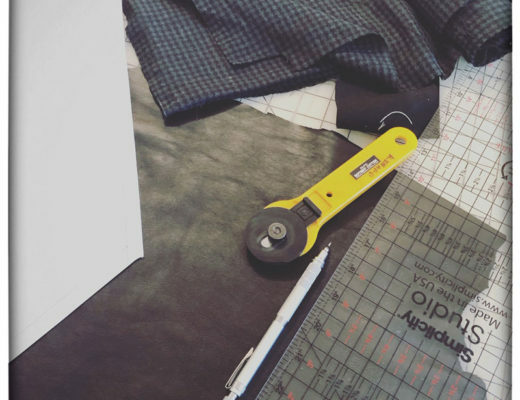 Tangential fix: the light colored silk lining of everything shows along the edge of all the pockets. Sharpie fixes that. 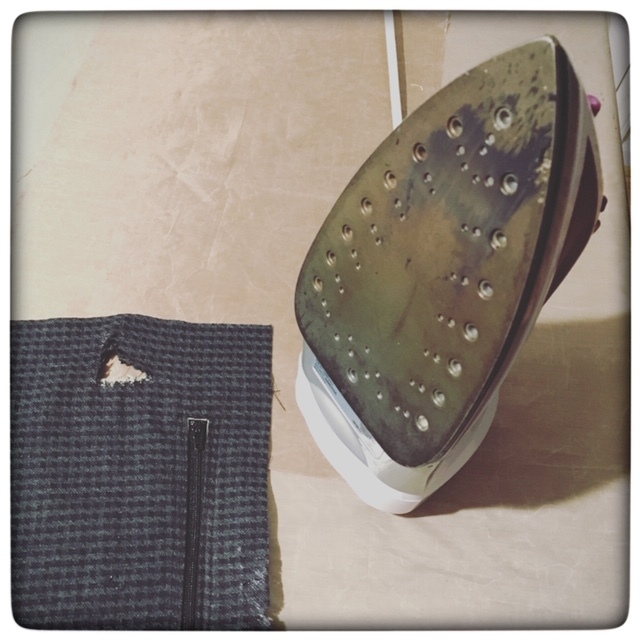 Mishap #3: I learned that if you sew too many times through leather it simply perforates it and… OFF it comes. Good thing I took the bag for a test run before hopping on an airplane with it. 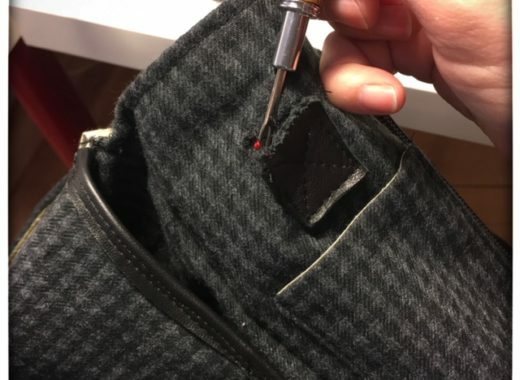 Fix: make sure the rivets go through the main bag and support it’s weight, not just the leather bits around the D-Ring. Sew with much longer stitch length than usual. Mishap #4: This is a photo of the first bag in which all the pockets meet at the seams. I won’t tell you how many needles I broke, because I can’t remember. It was AT LEAST two packs worth of nice leather needles. 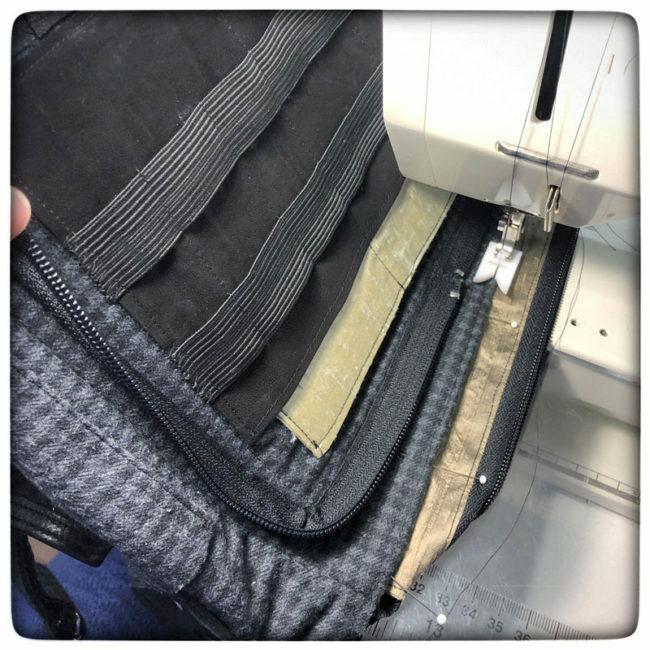 Fix: In the second bag, all of the pockets, inside and out, are finished before they meet the outer seams. 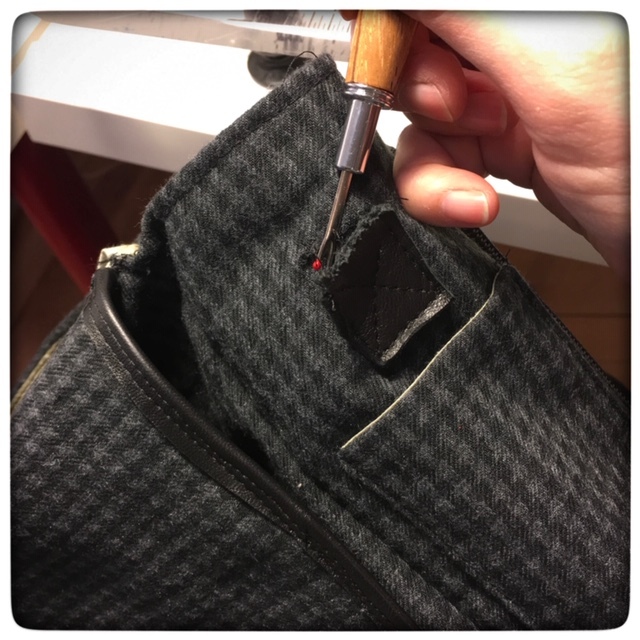 It was a pain, but the outer artist’s tools flap is now a zippered pocket and it works much, much better. 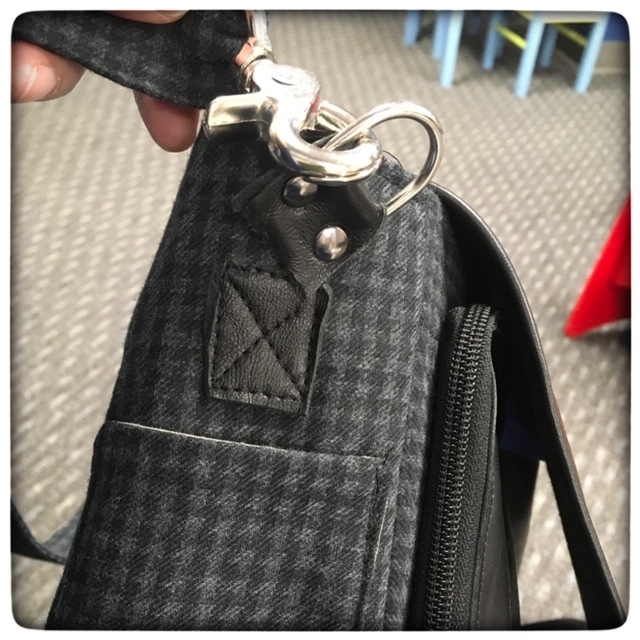 Mishap #5: I added a small loop and also handles to the outer flap after I had sewn the bag. I was also running out of rivets. 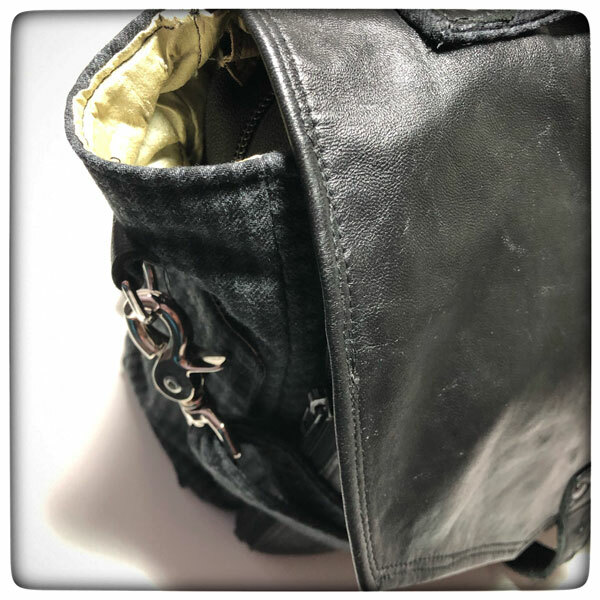 You can see by the deformed rivet on the upper right that one rivet is NOT enough to support the weight, even with stitching around it, of the bag without deforming. I’ll add another rivet later. You can also (barely) see how the stitching on my buckle tab is wearing. That thing bore a lot of weight all through my New Zealand trip. I’m surprised it survived. 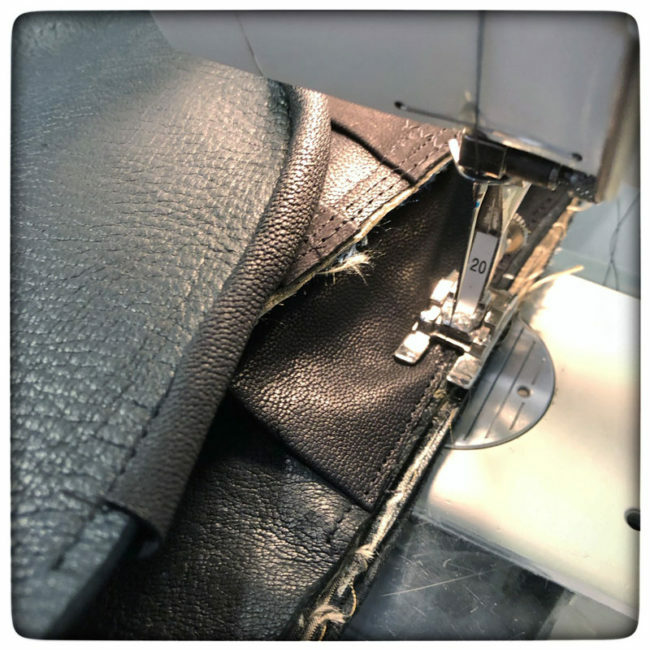 Mishap #6: If your straps are tight through your D rings (as they should be) and are going to get moved through sliders all the time, you might want to give them more than and almost nothing seam allowance when you turn them in. Fix: I’ll probably add fray check to the frayed edges, unpick the straight stitch, try to tuck everything back between the layers, then satin stitch the edge in that area. Nobody will notice except me, right? This isn’t a mishap – just a design flaw that I need to research. How does one keep the sides of the bag from pooching out from the flap. If you know – tell me. I never buy purses or bags so I don’t have any in the house to look at. And there you have it. The reality of living and working inside my designer’s head. I can think and think and think through an idea (I’ve been designing this for months) but without actually doing the thing I don’t know what issues are going to come up. This bag is NOT a failure in any way. It served me very, very well through a month of constant travel. It was the perfect size and didn’t fall apart. I think all the flaws can be managed or repaired and I’ll know how to do it better the next time. And that’s what being an artist is all about. I do not strive for perfection but I am constantly, CONSTANTLY, learning and growing and getting better. I strive for “better than the last time” and guess what… it almost always is! 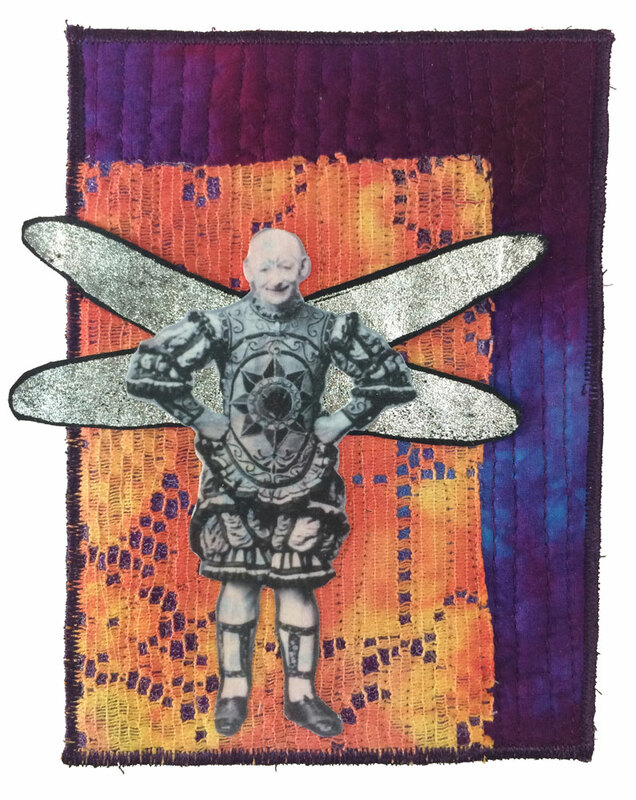 Tell me about a time when you LEARNED through doing something? Was it painful? Did you survive? Did you try again? Lyric, it’s so nice to see the process you sent through. Though I am not a bag maker, my suggestion would be to make the strap going through the D rings out of leather, if you could. It seems like leather would hold up better. As far as the gaping goes, could you put in a piece of elastic at the top of where it gaps? Would that help? I enjoyed all of your New Zealand photos—it’s on my bucket list.